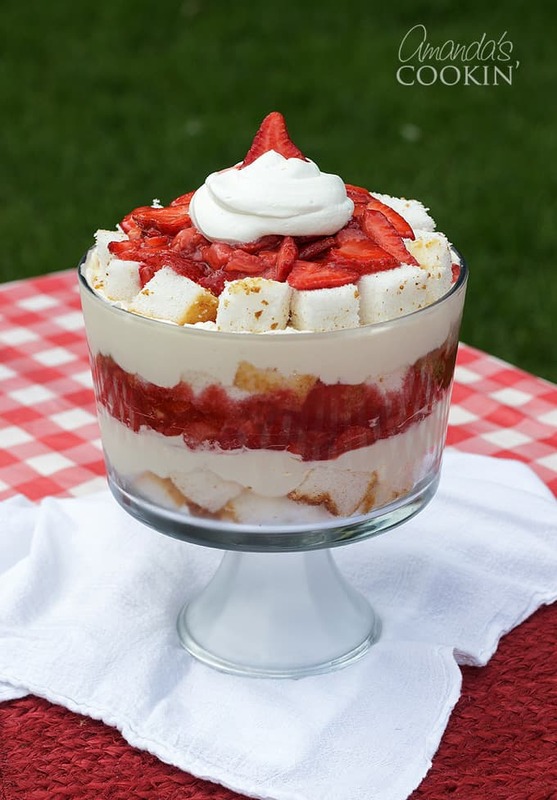 I am a long time lover of strawberry shortcake, but I think I love trifle recipes even more. 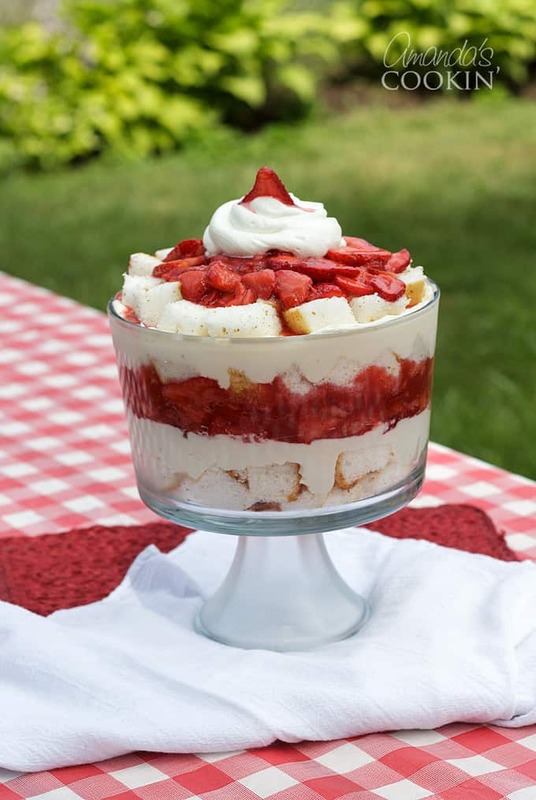 My Strawberry Shortcake Trifle is reminiscent of the famous cake, in that it uses a macerated strawberry sauce with the addition of fresh strawberries, and a delicious whipped cream and cream cheese layer, all stacked together in a trifle bowl with sweet angel food cake. 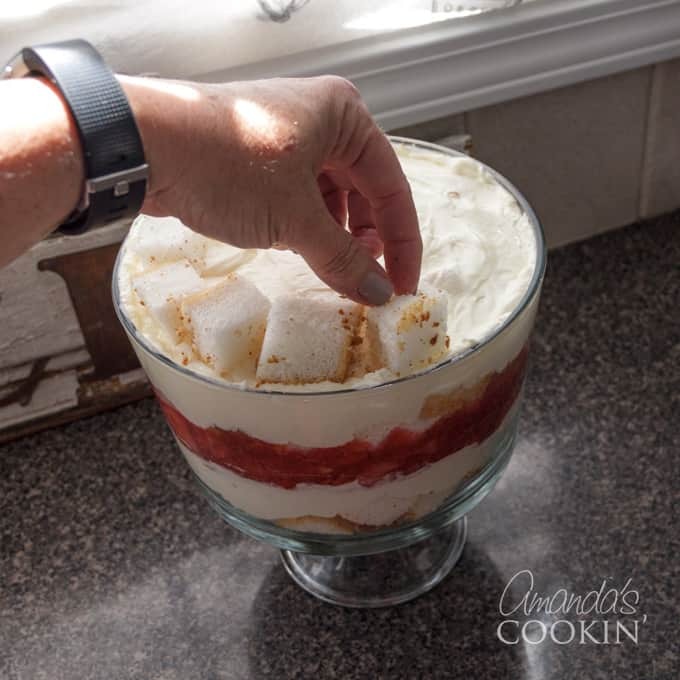 My favorite trifle recipe of all time is one that originates from England, my aunt’s English Trifle which gets its amazing flavor from cream sherry and berry jam. Oh, the childhood memories I have every time I take a bite! Summertime means an abundance of sweet, ripe strawberries. Here in Wisconsin, they are ready for picking in mid-June, but you can find loads of them at stores and farmer’s markets throughout the summer. Strawberries are the perfect dessert-making fruit for summer get-togethers and backyard parties. 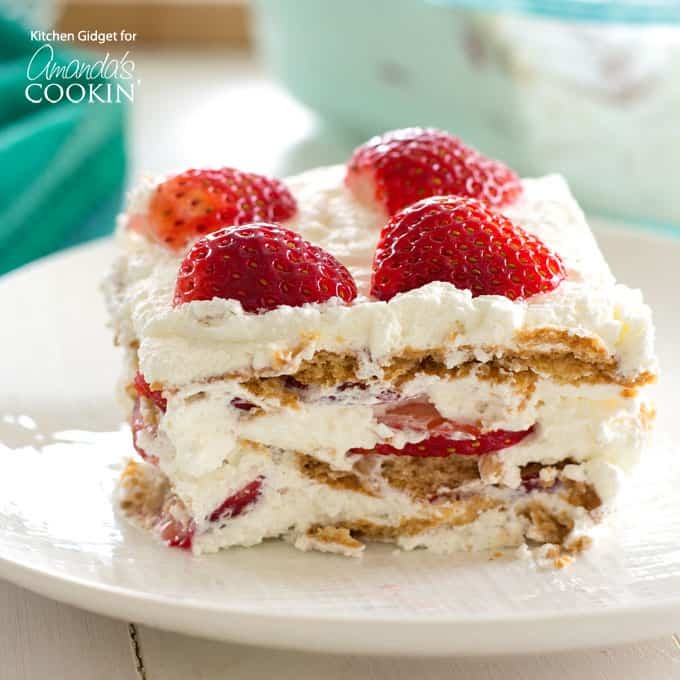 I can’t tell you how many times I’ve made this Strawberry Icebox Cake among others! 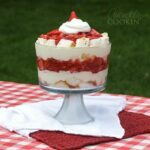 Making this Strawberry Shortcake Trifle is actually quite easy, but it does require a little planning ahead. 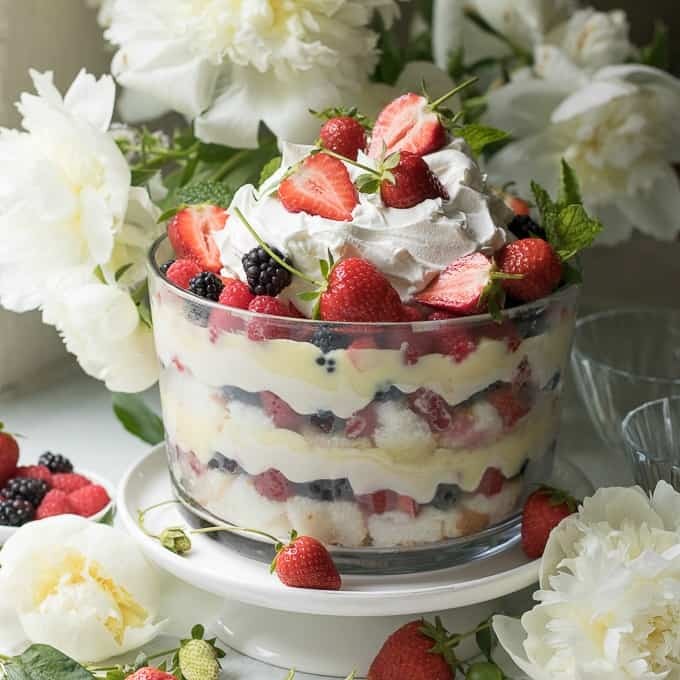 Here are some tips for making the perfect summer trifle. 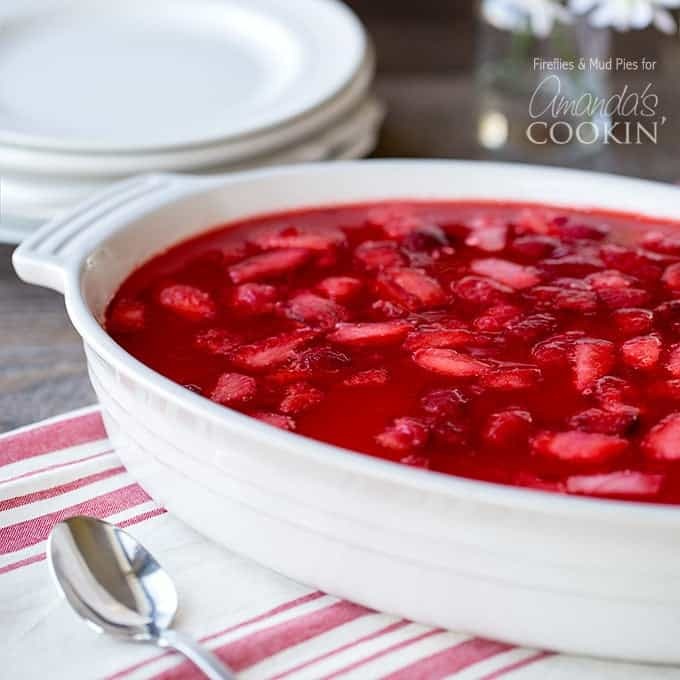 The strawberry sauce needs to be prepared first and a little early because it will need to cool. Cream cheese should be softened before beating it with the sugar, so take it out of the fridge about 30 minutes ahead. 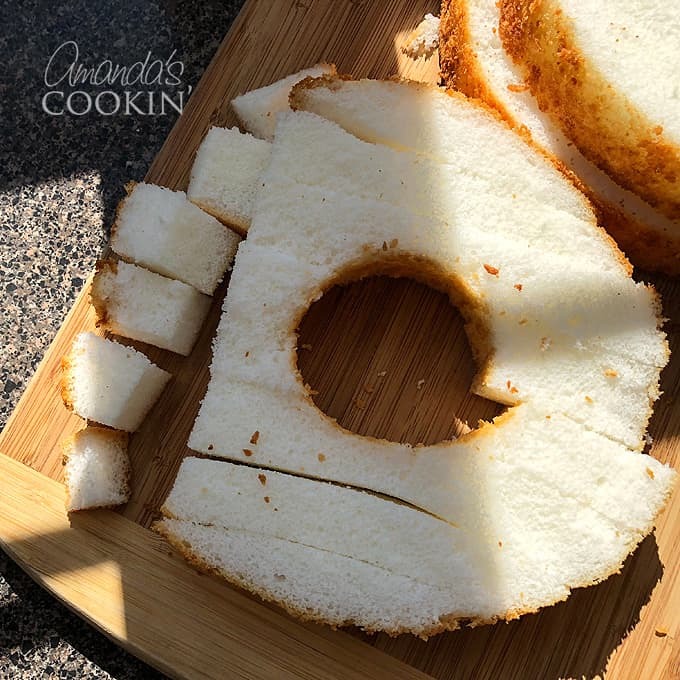 Cut the angel food cake into cubes using a sawing action with a bread knife. A straight edged knife will smash the cake down where you cut. 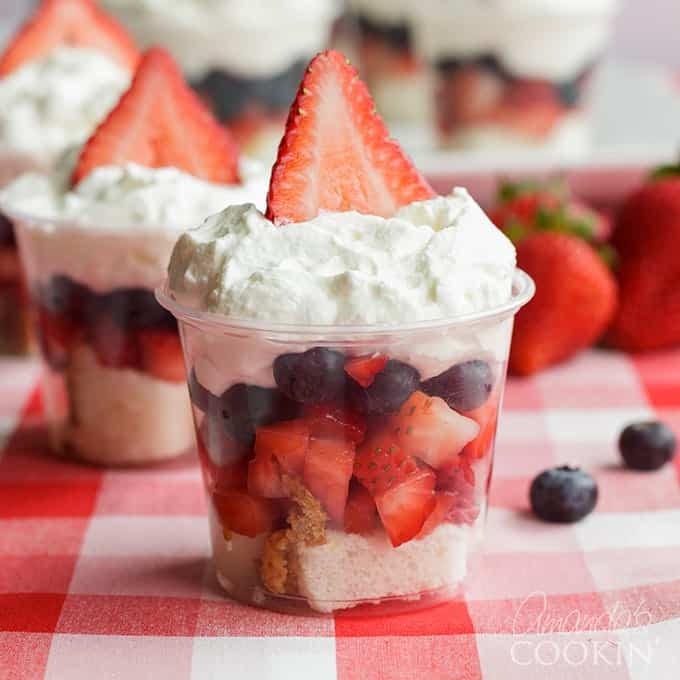 Trifles are best when they’ve had a chance to chill in the refrigerator, so plan on making this dessert the day before or early in the morning. The angel food cake cubes will soak up the strawberry sauce, yum! We used Cool Whip in ours, but you can absolutely substitute fresh whipping cream instead. 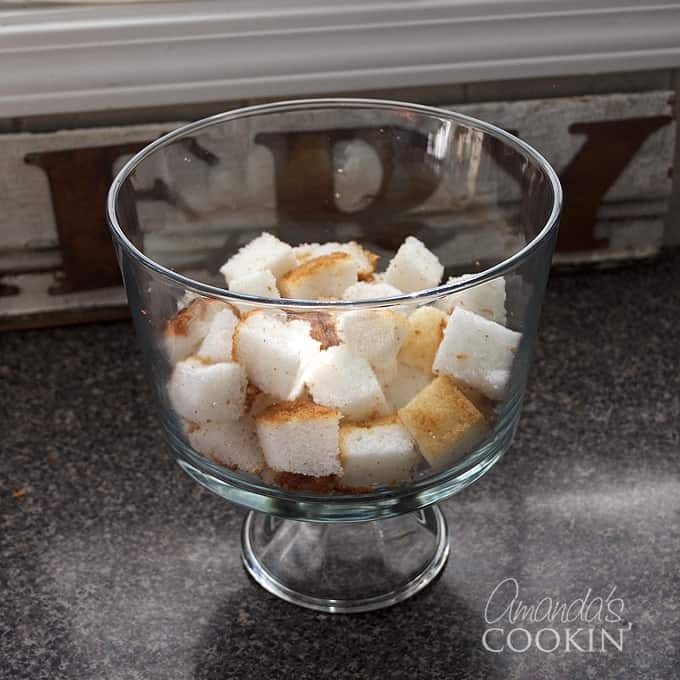 Angel food cake – You can absolutely make an angel food cake from scratch, but it’s much easier to buy it at the grocery store. I did notice there are really light angel food cakes and some denser ones. Make sure you get a light one, mine weighed about 19-ounces once out of the container. A denser angel food cake will be shorter as well. 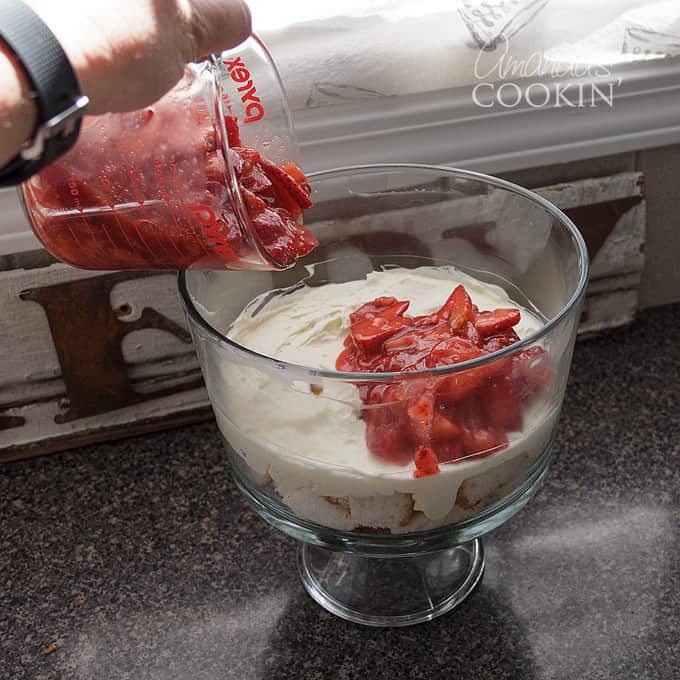 Strawberries – You’ll need 2 quarts of ripe but firm berries for this trifle recipe, one for making the sauce and the second for mixing into the sauce, so be sure to keep them separate. 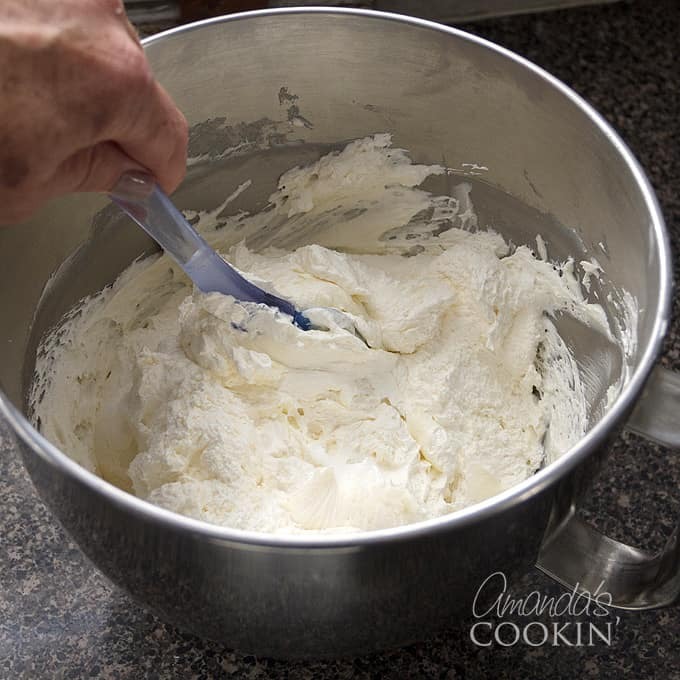 Whipped topping – A tub of Cool Whip, any variety (original, fat-free, etc) will work perfectly. If you prefer fresh whipped topping, beat 1 cup of heavy whipping cream with a tablespoon of powdered sugar until stiff peaks begin to form. Cream cheese – Just like with the Cool Whip, any variety should work just fine (low-fat, original, etc) – just be sure to let it come to room temperature before using it in this recipe. Room temperature means you should remove it from the refrigerator about 30 minutes prior to using it so that it’s had time to soften up. Cold cream cheese can be lumpy even after excessive mixing and beating. 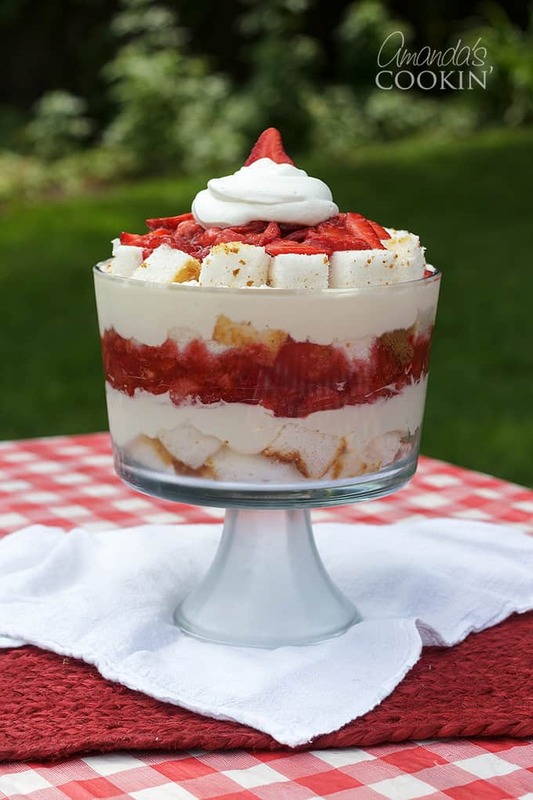 Sugar – Can you use a sugar substitute for this Strawberry Shortcake Trifle? Probably, especially if you are already accustomed to the taste variation. Just follow the substitution instructions on the package. 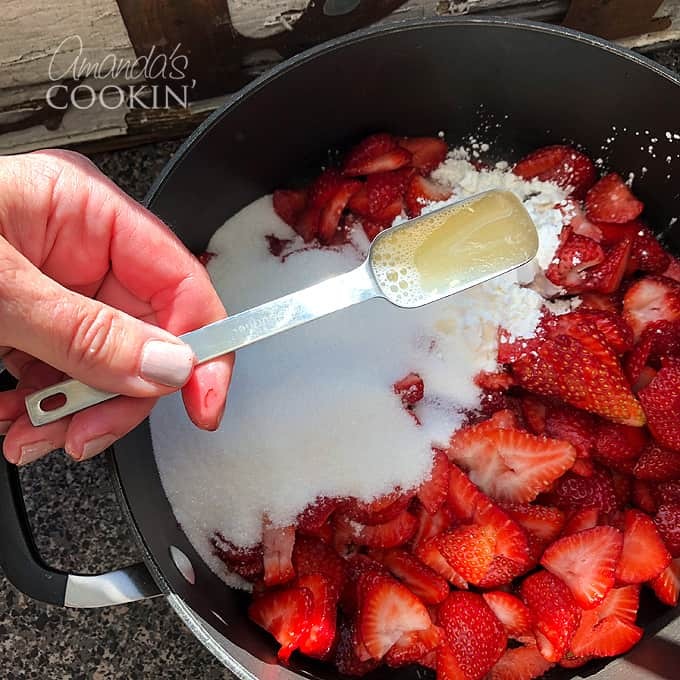 Cornstarch – This is used to thicken the strawberry sauce, but I don’t recommend substituting flour. Some things are just better with cornstarch. Lime – Just a squeeze of one-half of a medium lime will yield the necessary one tablespoon needed. Here’s exactly how to make this delicious trifle, and I’ve inserted some tips along the way as well. You’ll buy two quarts of strawberries for this sauce, but only one of those quarts will be cooked. So be sure to keep them separate. 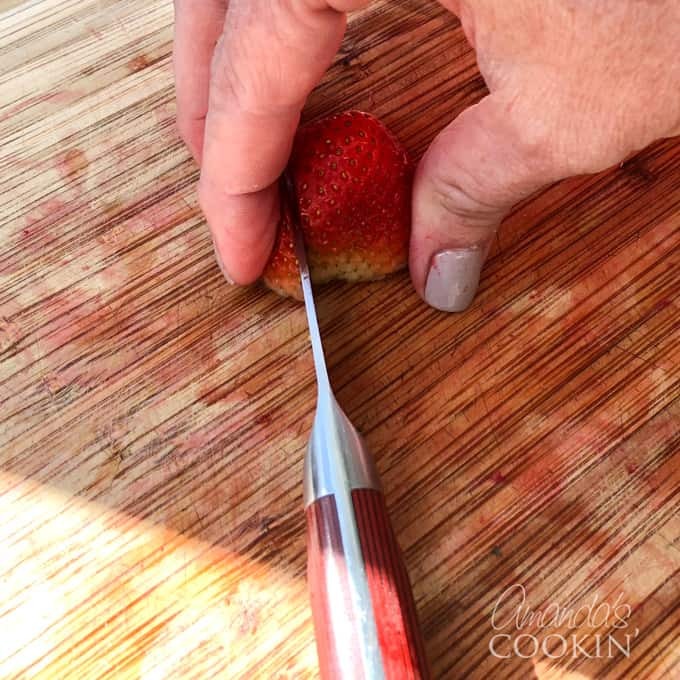 TIP #1: After you’ve cored the strawberries, hold the berry, top down on the cutting board, between your thumb and forefinger. Holding the berry this way makes it easy to slice the berry into even pieces. 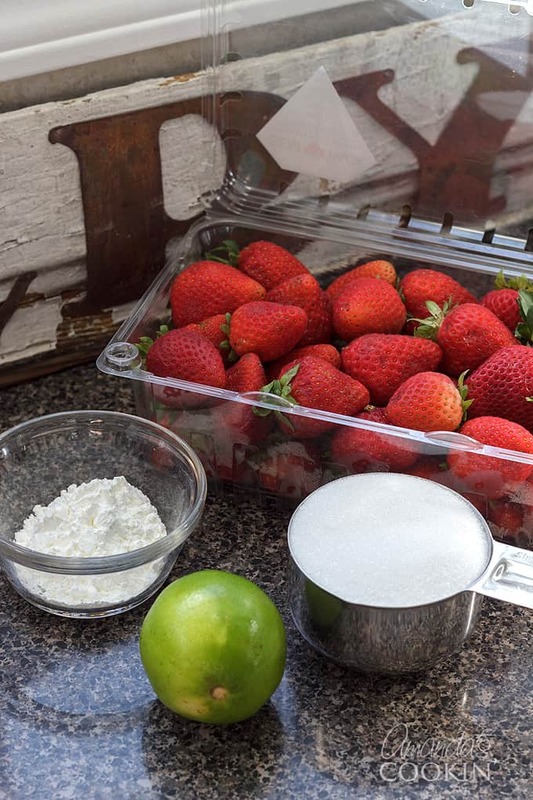 Combine one-quart of sliced strawberries, sugar, cornstarch and lime juice in a large saucepan. Cook over medium heat, stirring occasionally, bringing to a gentle boil. Continue the gentle boil for about 3 minutes, then reduce heat to low and cook 5 more minutes. Strawberries should be soft and the sauce should be thick but not pasty. TIP #2: If you are in a time crunch, spread the hot strawberry mixture into a shallow pan. Spreading the mixture out will allow it to cool faster. Speed it up even more by placing this dish into the refrigerator. When cool, add the second quart of sliced fresh strawberry and stir to combine well. Set aside. 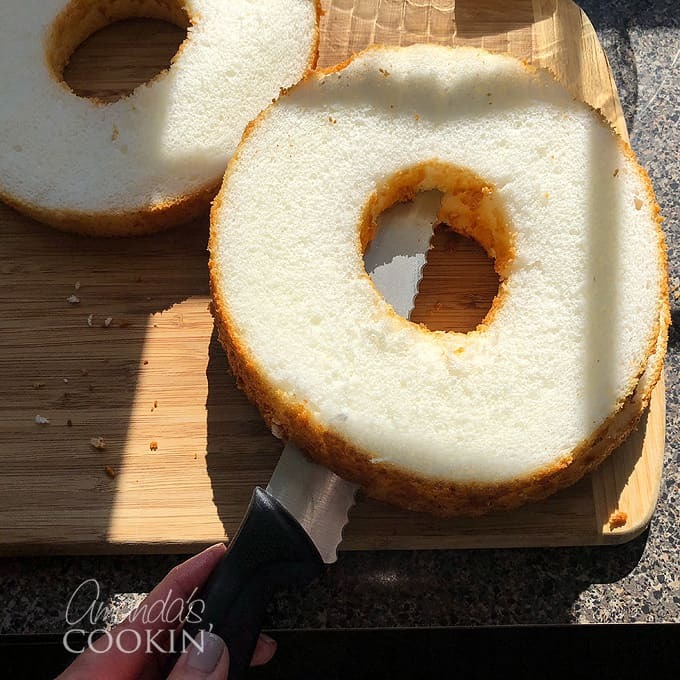 Using a serrated bread knife, cut the cake into three even layers, they will look like donuts. Cut those layers into 1.5-inch cubes and set aside. Beat the cream cheese and sugar on medium-high speed until light and fluffy. Reserve 1/4 cup of Cool Whip to for the top of the trifle, store in the refrigerator until needed. Fold the remaining Cool Whip into the cream cheese mixture. This recipe will fit nicely into a 13-cup (liquid measure) trifle bowl. You will likely have a little cake and strawberry sauce leftover. TIP #3: Don’t toss the extra cake and sauce! you can get a little more whipped cream and make a dessert out of it, or serve the sauce over vanilla ice cream. 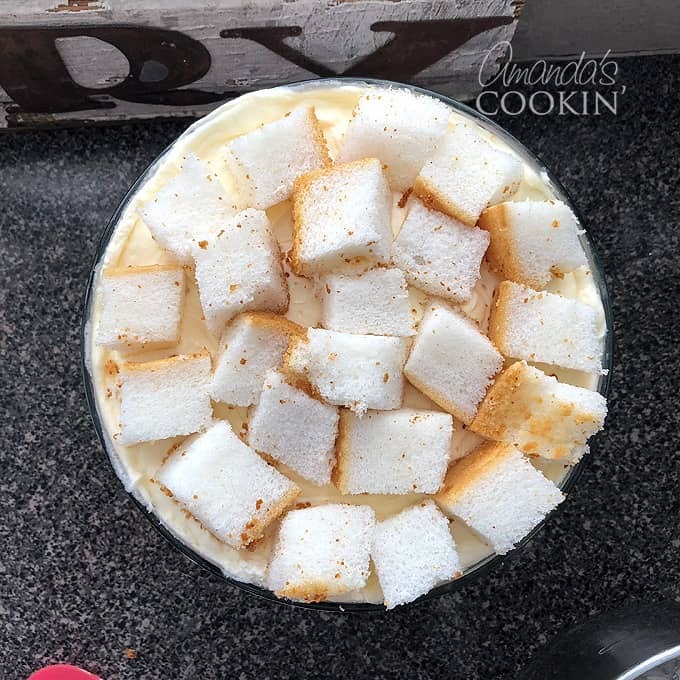 Add a generous single layer of cake cubes to the bottom of the trifle bowl. Turn the pieces along the bowl edge so that the white side shows through the glass. 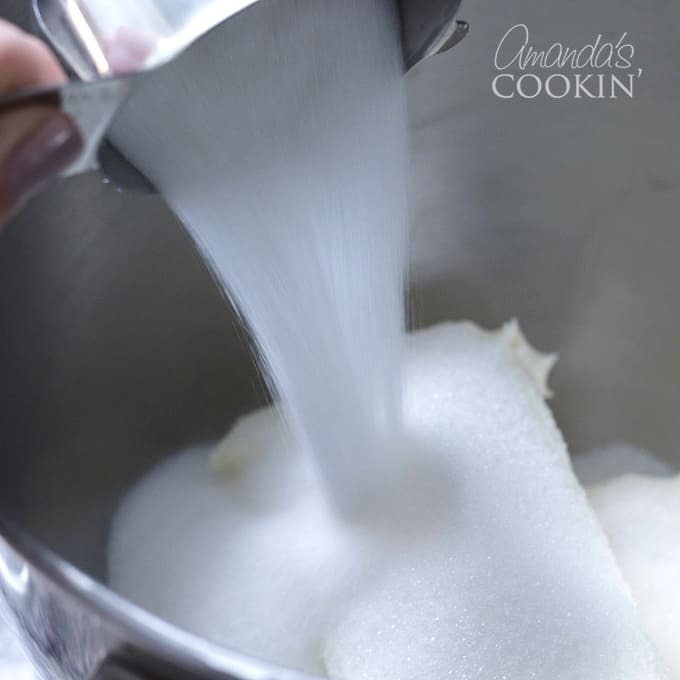 Using a rubber spatula, add dollops of cream cheese mixture carefully over the cake cubes. Start along the glass and finish in the center. use your rubber spatula to carefully spread the mixture and tap it down. Top the cream cheese layer with half of the strawberry sauce. 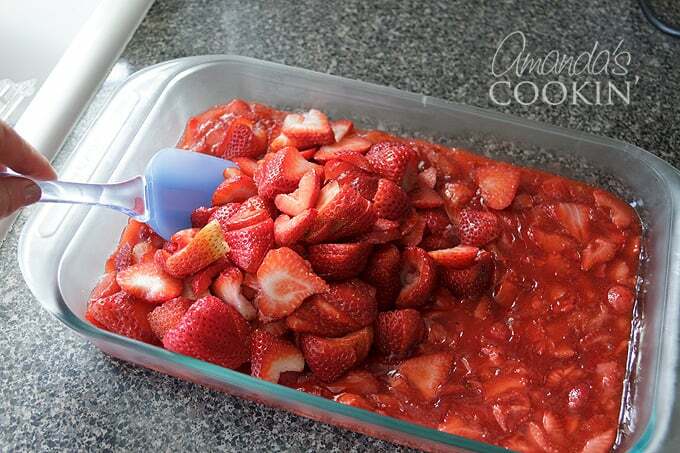 Add a single layer of cake cubes over the top of the strawberry sauce, placing each piece rather than dumping them on. Again, using a rubber spatula gently add the remaining cream cheese mixture over the cake. Use the rubber spatula to carefully press along the edge, pushing the cream cheese mixture down into the cake. Place cake cubes onto the cream cheese mixture, positioning them carefully so that the white side of the cake faces outward. Pile strawberry sauce into the middle of the top layer, leaving the outer cake pieces visible. 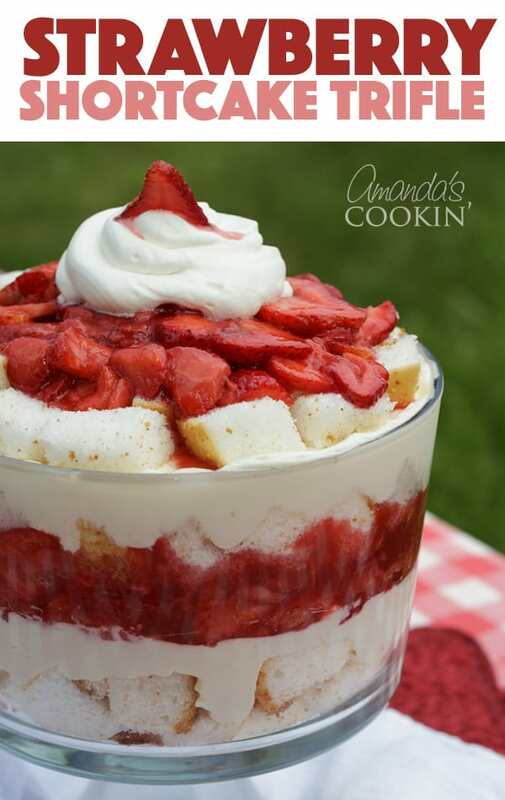 Add reserved whipped topping to the center of the strawberry sauce and garnish with a sauced strawberry slice. TIP #4: Finally, when you’re finished assembling the trifle, be sure to let it chill for at least an hour. Longer is better, so if you can make this in the morning it will be good to go for your afternoon or evening barbecue. I promise, allowing the angel food cake cubes time to soak up some of that strawberry sauce is so worth it! Related: We just added this Chocolate Lasagna Trifle for all of you chocolate lovers out there! And don’t forget about this amazing Chocolate Texas Sheet Cake for your summer get togethers. 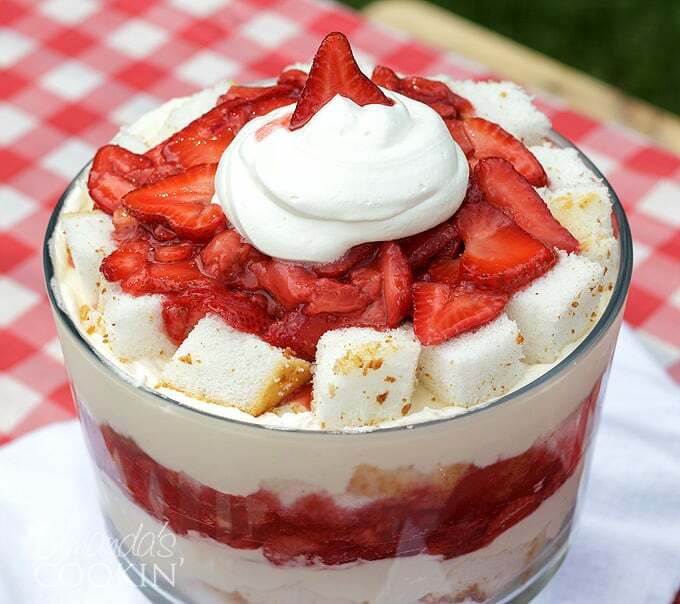 My Strawberry Shortcake Trifle is reminiscent of the famous cake, in that it uses a macerated strawberry sauce with the addition of fresh strawberries, and a delicious whipped cream and cream cheese layer, all stacked together in a trifle bowl with sweet angel food cake. Again, using a rubber spatula carefully add the remaining cream cheese mixture over the cake. Use the rubber spatula to carefully press along the edge, pushing the cream cheese mixture down into the cake. I love strawberry shortcake! 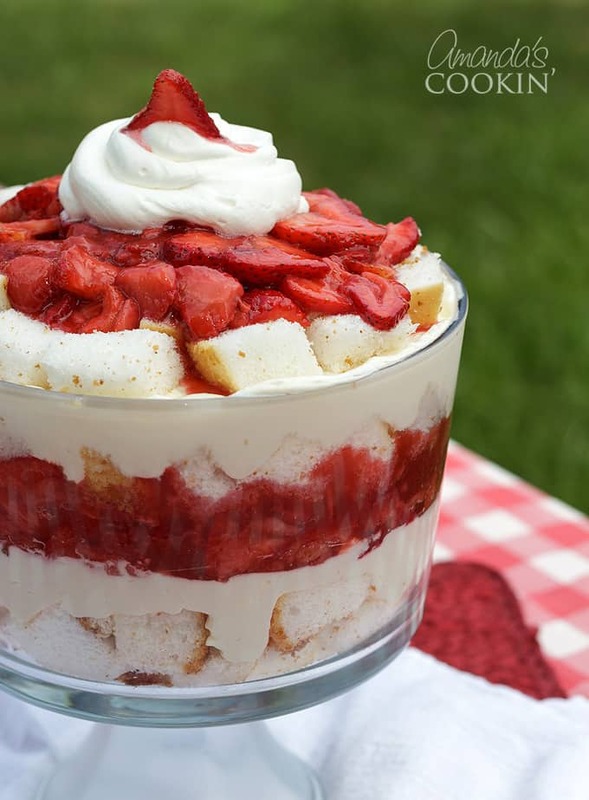 This trifle looks perfect! Thank you Natalie! It’s so delicious!